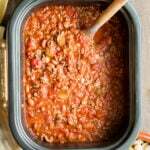 This Slow Cooker Chuck Wagon Chili has layers of flavor and is sure to be your favorite go to chili recipe. 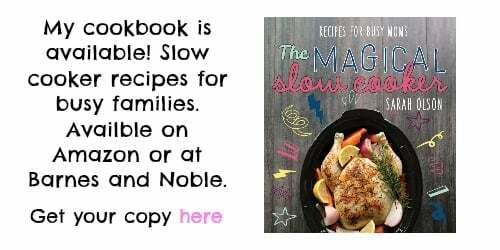 Welcome to the third edition of Vintage Slow Cooker Recipe of the Month. I researched various chuck wagon chili recipes on the web. It seems that everyone has their own versions. I tried to create a recipe here that has many layers of flavor. I imagined the cook of the chuck wagon adding bits of ingredients all day until a perfect chili was created. The beer, Worcestershire sauce and the brown sugar give this chili a unique flavor. I had planned to give the extras from this recipe to our neighbors. My husband saw me starting to dish up their portion, and suggested we save it instead and make nachos later in the week with it. That was a great idea! (Sorry Nikki!). My husband must of been a huge fan of this chili, because normally with chili he can barely stand leftovers just once. Not only does this chili have an amazing flavor but also the consistency is just right. See below how the ratio of the beef and beans to the sauce is perfect. I don’t have many recipes besides clam chowder that I buy oyster crackers for. When I was checking out at the store buying these crackers, the man in front of me commented how those crackers bring him back 30 years. I had to giggle knowing I was going home to top my vintage chili recipe with those crackers. 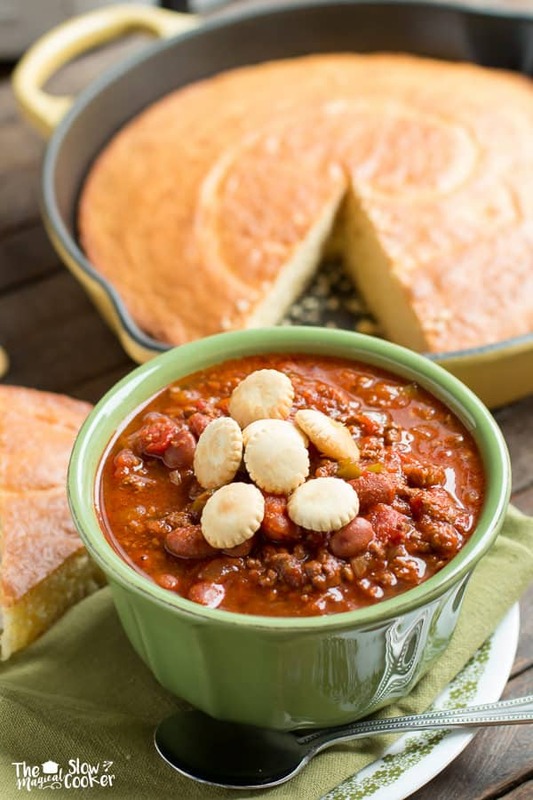 I also served this Chuck Wagon Chili with cornbread baked in my Le Creuset cast iron pan. My favorite cornbread right now is Krusteaz Honey Cornbread, though I do love their Southern Style too. 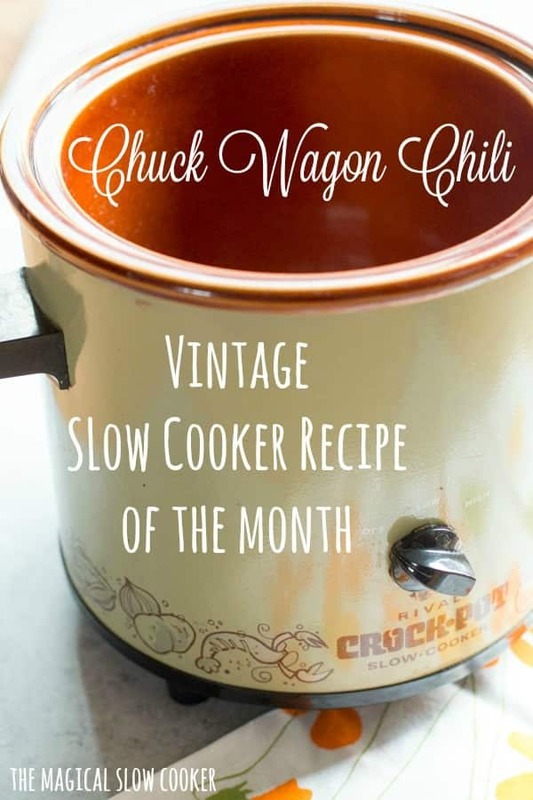 Below is my video on how to make this Slow Cooker Chuck Wagon Chili. You can follow me on YouTube, here. I hope you enjoy this recipe, I think it will become your new favorite chili. Have a great week and I will have another recipe for you soon! A great chili recipe made with beer and a touch of brown sugar! Add everything to the slow cooker, except the beef bouillon cube and the water. Add the beef bouillon cube and water to a microwavable glass cup. Microwave for 40 seconds, or until the water is hot enough to melt the cube. Stir the cube in the water until dissolved. Add this to the other ingredients in the slow cooker, stir. Cover and cook on LOW for 8 hours without opening the lid during the cooking time. Nutritional Values are approximate, if you require a special diet use your own calculations. 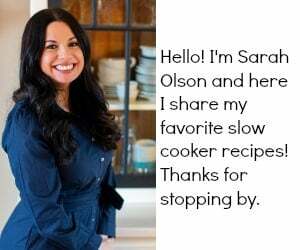 This chili looks delicious, Sarah! I always make my chili in my slow cooker. I’ll have to try your recipe soon! My daughter says this is the best chili she has ever eaten!!!!!! Love this theme. Looks like a delicious old-fashioned chili. 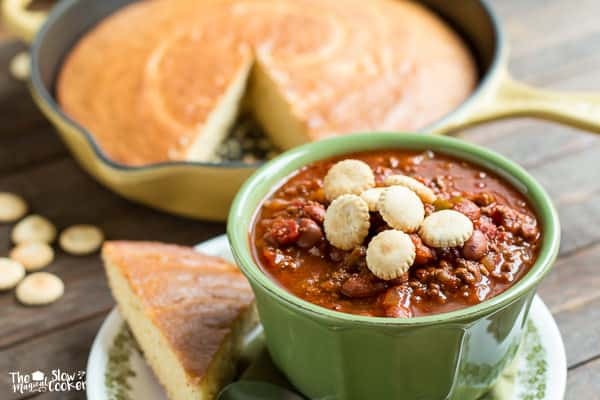 Doesn’t get much better than chili with cornbread! 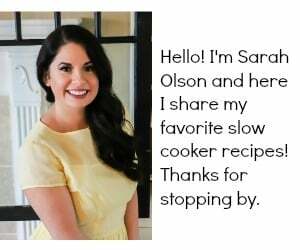 This retro recipe looks delicious and I love your retro slow cooker too! This chili sounds perfect! 🙂 And I love that you topped them with oyster crackers. I usually associate oyster crackers with Cincinnati style chili. I was wondering what cumin you all used the seeds or the ground? Ground! I will fix that on the recipe. Thank you! Can this be cooked on high for four hours rather than low for eight? Thank you so Much! Iv’e made this a few times following recipe, but this morning I forgot to put it on so it could sit for full 8 hours. Thank you for quick input! By the way, I have made and saved quite a few of your delicious recipes, thank you. 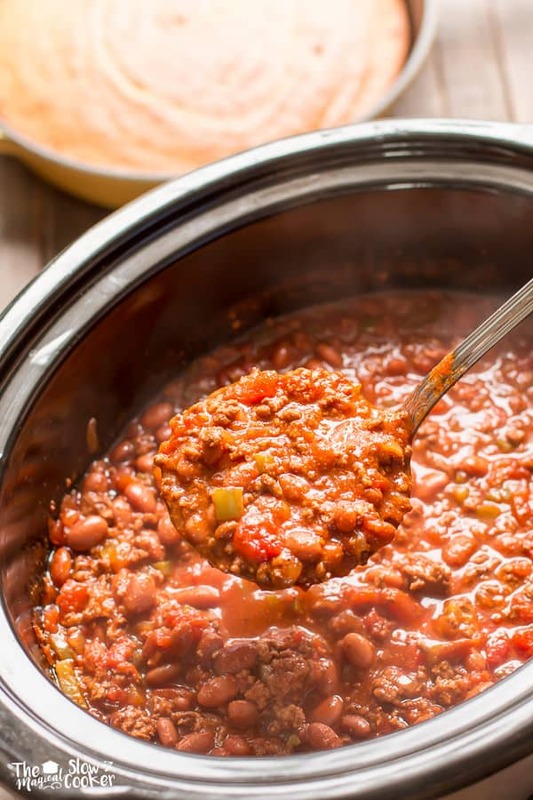 This is now my go-to slow cooker chili recipe, I’ve tried several others but this one is just about right. I have yet to try it with beer (only thing I’ve left out, never seem to have it on hand) but it still has plenty of liquid. Great to hear Hodor! I know some don’t use beer or have beer. No you can’t really taste the cumin. Cumin isn’t spicy, the chili powder would add the spice. I usually use budwiser, or bud light. Would you know the serving size? I am anxious to try this recipe. What can be used instead of the beer that will yield the same good recipe? I would do beef broth or a cup of water and another beef bouillon cube. Will this have a beer taste to it? Hi there. If not beer then can some red wine be used? Thank you so much for your recipe chuck wagon chili Sarah delicious. This is the way I’m gonna make my chili in the slow cooker from now on. Can you use dry pintos instead of canned? If so, would an overnight soak be sufficient? Yes you can, I’d do at least 9 hours on low and add a bit more liquid. Hi I’m wondering if I can use ground turkey for this recipe or if I should make your chipotle chili instead? I’m partial to the ingredients you have in this one but I don’t want to make a huge mistake. Ground turkey would be great in this! I’m making it right now! Thank you Sarah!! There are 8 servings in this recipe. 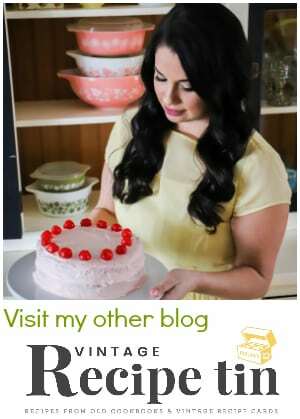 My recipes are free for you to enjoy. I don’t have the time to measure the entire recipe volume before feeding my family. mY MOTHER HAD THIS CROCK POT. wHEN SHE DIED, i INHERITED IT. wHEN MY GRANDDAUGHTERS GO FOR DANCE COMPETITION, i GET IT OUT AND FILL IT WITH HER MEATBALL AND SAUCE RECIPE. i SEND IT TO MY SON’S HOUSE AND HE GETS A DOUBLE WAMMY, GRANDMA, AND MY COOKING.